In 2018, news organizations must track emerging technology trends across a variety of sectors, including artificial intelligence, social media, data mining and analysis, hardware and distribution. NOTE: This report is specific to news and entertainment media. If you're looking for the 2018 FTI Emerging Tech Trends Report (our big annual report with tech trends across all industries), click here. 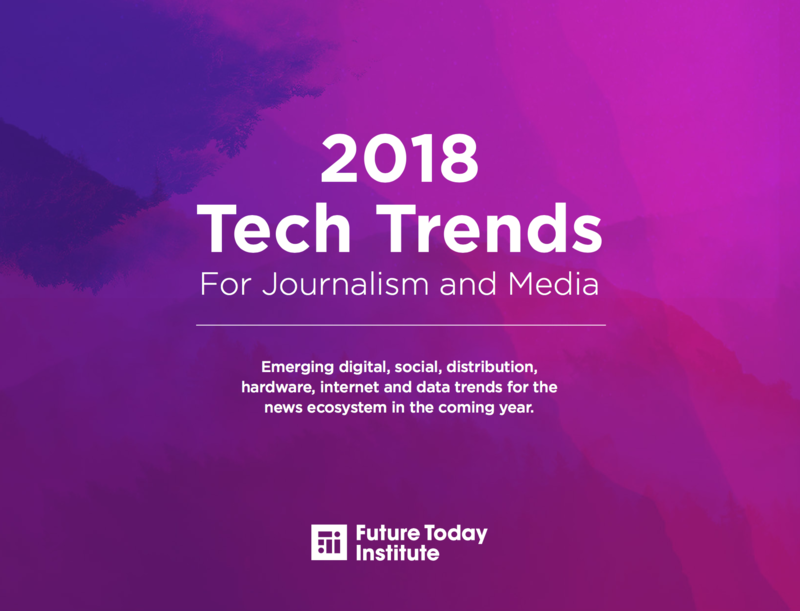 The Future Today Institute’s 2018 Tech Trends For Journalism Report is our first industry-specific analysis of emerging technology trends. It follows the same approach as our popular annual trends report, now in its 10th year with more than 6 million cumulative views. We have highlighted 75 important technology trends that everyone working within the news ecosystem should be following. 2018 marks the beginning of the end of smartphones in the world's largest economies. What's coming next are conversational interfaces with zero-UIs. This will radically change the media landscape, and now is the best time to start thinking through future scenarios. In 2018, a critical mass of emerging technologies will converge finding advanced uses beyond initial testing and applied research. That’s a signal worth paying attention to. News organizations should devote attention to emerging trends in voice interfaces, the decentralization of content, mixed reality, new types of search, and hardware (such as CubeSats and smart cameras). Journalists need to understand what artificial intelligence is, what it is not, and what it means for the future of news. AI research has advanced enough that it is now a core component of our work at FTI. You will see the AI ecosystem represented in many of the trends in this report, and it is vitally important that all decision-makers within news organizations familiarize themselves with the current and emerging AI landscapes. We have included an AI Primer For Journalists in our Trend Report this year to aid in that effort. Consolidation is also a key theme for 2018. News brands, broadcast spectrum, and artificial intelligence startups will continue to be merged with and acquired by relatively few corporations. Pending legislation and policy in the U.S., E.U. and in parts of Asia could further concentrate the power among a small cadre of information and technology organizations in the year ahead. To understand the future of news, you must pay attention to the future of many industries and research areas in the coming year. When journalists think about the future, they should broaden the usual scope to consider developments from myriad other fields also participating in the knowledge economy. Technology begets technology. We are witnessing an explosion in slow motion. Those in the news ecosystem should factor the trends in this report into their strategic thinking for the coming year, and adjust their planning, operations and business models accordingly. Founded in 2006, the Future Today Institute helps leaders and their organizations prepare for complex futures. FTI focuses exclusively on how emerging technology and science will disrupt business, transform the workforce and ignite social and geopolitical change. FTI’s forecasting methodology has been featured in the MIT Sloan Management Review and in the Harvard Business Review, and it is taught at universities around the world. The Future Today Institute will use the information you provide on this form to (a) send you the 2018 Emerging Tech Trends Report you requested and/ or to (b) share a different research report with you and/or (c) to send you our emerging tech trends newsletter (there are two issues a month). We only share research using email. Please tick the Email box below to opt-in. You can change your mind at any time by clicking the unsubscribe link in the footer of any email you receive from us, or by contacting us at hello@futuretodayinstitute.com. We will treat your information with respect. We do not share your information with any third-parties. For more information about our privacy practices please visit our website. By clicking below, you agree that we may process your information in accordance with these terms.